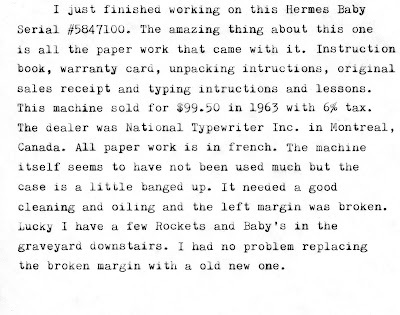 Life in a Typewriter Shop: Before & After... And More. Before & After... And More. This Smith Premier No. 10 is 100 years old. Looks much better and types pretty nice. 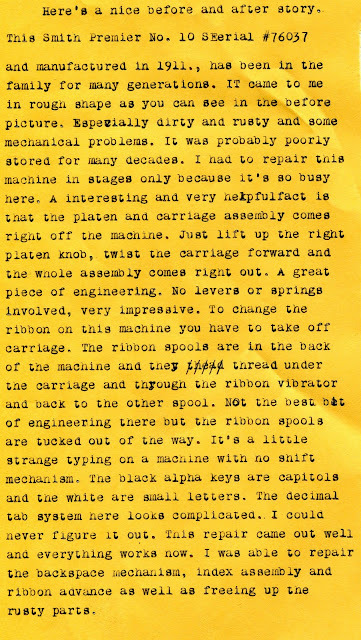 Check out the ribbons spools in back of machine. I like machines with old dealer stickers om them. Great job on the SP10! 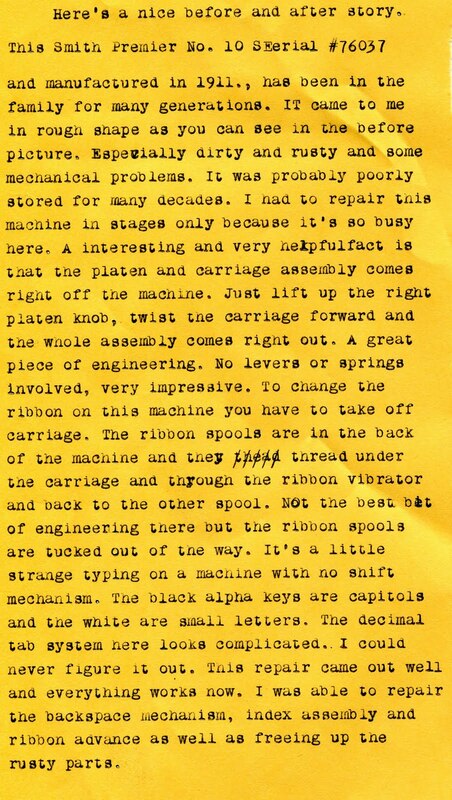 I always wondered how you changed the ribbon on those crazy spools. Now I know you have to remove the carriage. Wow. 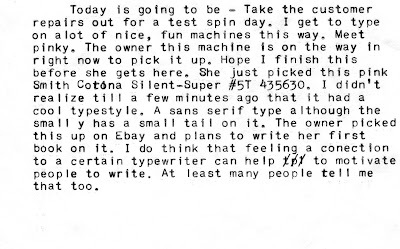 That Smith-Corona is probably the freshest-looking pink '50s machine I've ever seen. So often they look faded and dirty. 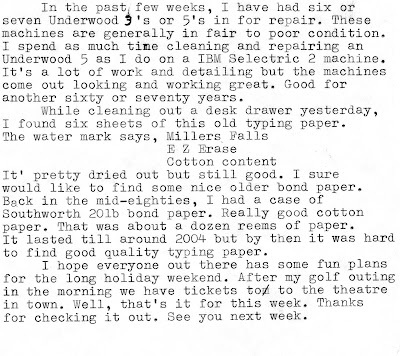 Southworth still makes lots of good paper, and I bet most of it is good for typing. I like to promote them because the company was founded by one of my great-great-great-grandfathers, and manufactured the first typewriter paper for Remington. 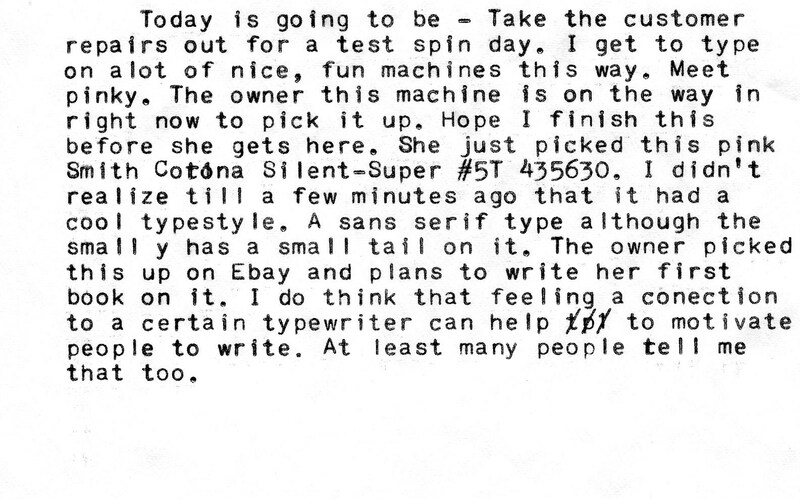 Great sans-serif typeface on the Smith Corona Silent Super! Reminds me a bit of Remington's Art Gothic. I love unusual typefaces and this one must have been a nice surprise as the sellers rarely include type samples on eBay auctions. Nice to meet you, Pinky! 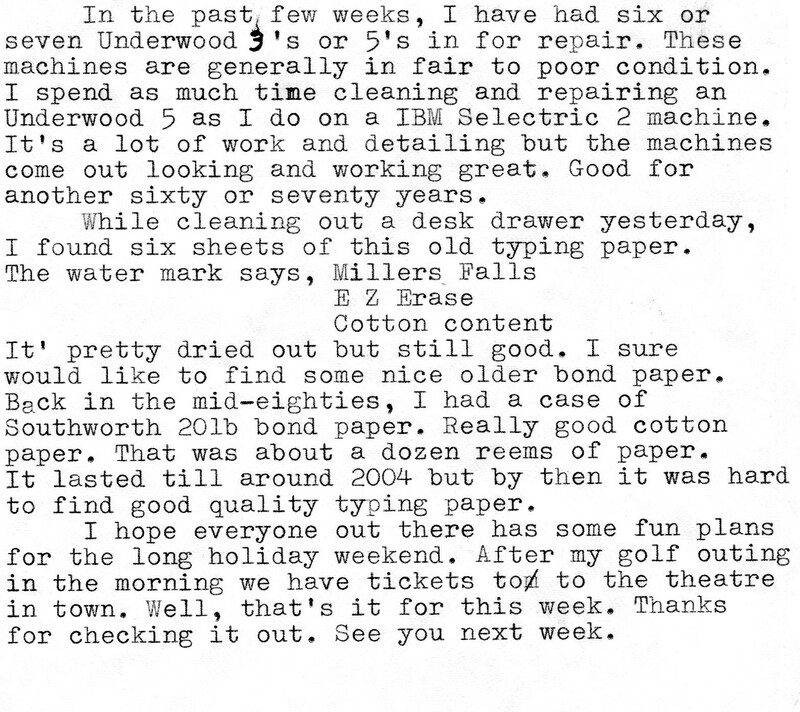 Yes, Underwood 5's are great -- luckily mine is in decent condition, given to me by a dear friend in May. It will outlive me, I am sure. I'm having a great time using my (revamped by Tom) "Underwood 3". Its like "brand new". Thanks Tom - great work! What a fun PINK machine. I love the design of that machine. I'm hoping one of you can help me with a decision. I need to know if the fourth model Olympia SM9 is an equal typer, at least in touch/ feel to the 3rd model SM9. In other words a 1972 all metal Olympia SM9 vs a 1968 model.